for father's day, ryan and i made cupcakes for dessert. 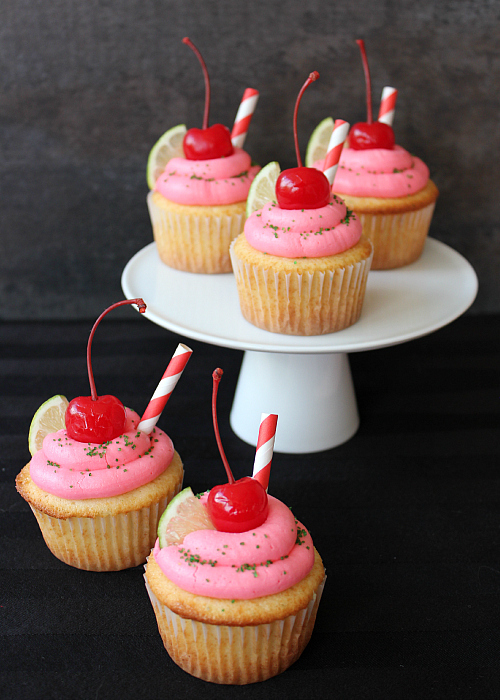 we wanted to make something different than regular chocolate or vanilla cupcakes, so we decided to make cherry limeade cupcakes. i love flavored lemonade and limeade. 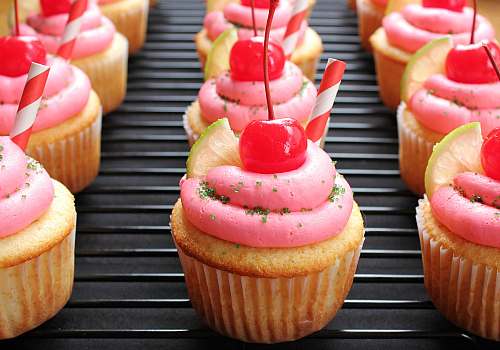 cherry limeade is such a refreshing treat in the summer, and it translates perfectly into cupcake format! 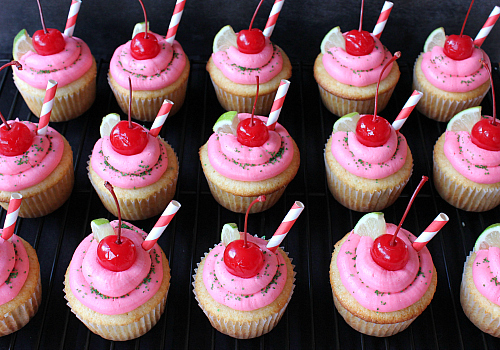 these cupcakes are full of fresh lime flavor. the vanilla cake has fresh lime juice and lime zest in it. after the cupcakes baked, we brushed fresh lime simple syrup over the tops of them too. we topped the cupcakes off with cherry frosting. the color of the frosting is so vibrant and cheery, and the cherry flavor is wonderful. the flavors of the lime and the cherry blend together perfectly. such a good combination! yum! 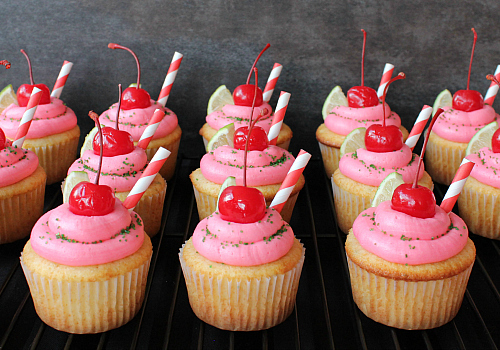 these cupcakes scream summer. they are so light and refreshing, and they're not too sweet. 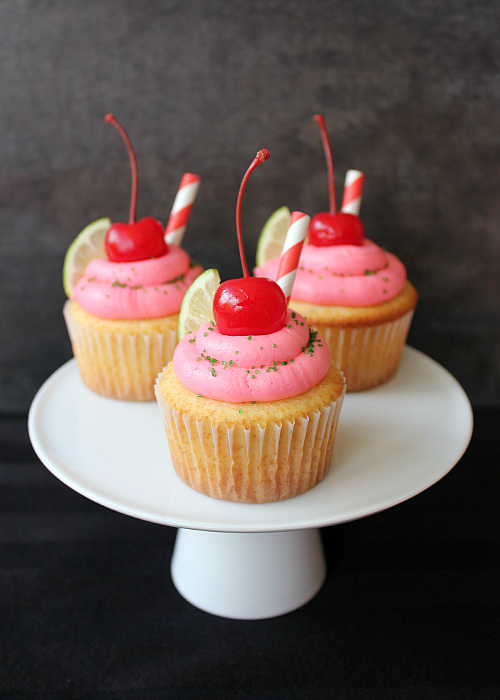 to make them look like little cups of cherry limeade, we topped them off with a fresh lime wedge, a maraschino cherry, and a little paper straw. preheat your oven to 350 degrees F. line cupcake pans with paper cupcake liners. to make the cupcakes, in the bowl of an electric stand mixer fitted with a paddle attachment, cream the butter for 1-2 minutes. in a food processor, pulse together the granulated sugar and the lime zest until finely ground. add the lime sugar to the butter and whip until light and fluffy (about 3-4 minutes). beat in the egg, then beat in the egg whites, one at a time. add the vanilla and mix well. sift the flour, cake flour, baking powder, and baking soda into a large bowl. in a separate bowl, whisk together the buttermilk with the lime juice. add one third of the sifted dry ingredients to the batter and beat until just combined. mix in half of the buttermilk and lime juice mixture. repeat with another third of the dry ingredients and the second half of the wet ingredients. then add the remaining third of the dry ingredients. beat until combined. pour the batter into the prepared cupcake pans, filling each about two-thirds of the way full. bake for 18-20 minutes, or until a toothpick inserted into the center of the cupcakes comes out clean. allow the cupcakes to cool completely before frosting. to make the frosting, combine the butter, cherry juice, and 1/2 cup of the powdered sugar in the bowl of an electric stand mixer fitted with a whisk attachment. whisk together until combined. gradually add the remaining powdered sugar. add red food coloring if desired. use a piping bag to pipe the frosting on top of the cooled cupcakes. Those look way too good to eat! Seriously, you have a talent for baking yummy looking treats! !